The Louisiana Air National Guard (LA ANG) is the air force militia of the U.S. State of Louisiana. It is, along with the Louisiana Army National Guard, an element of the Louisiana National Guard. As state militia units, the units in the Louisiana Air National Guard are not in the normal United States Air Force chain of command. They are under the jurisdiction of the Governor of Louisiana through the office of the Louisiana Adjutant General unless they are federalized by order of the President of the United States. The Louisiana Air National Guard is headquartered at the Naval Air Station Joint Reserve Base New Orleans, and its commander is Colonel Pat Griffin. Under the "Total Force" concept, Louisiana Air National Guard units are considered to be Air Reserve Components (ARC) of the United States Air Force (USAF). Louisiana ANG units are trained and equipped by the Air Force and are operationally gained by a Major Command of the USAF if federalized. In addition, the Louisiana Air National Guard forces are assigned to Air Expeditionary Forces and are subject to deployment tasking orders along with their active duty and Air Force Reserve counterparts in their assigned cycle deployment window. The Louisiana ANG's flying unit, the 122nd Fighter Squadron, is nicknamed the "Bayou Militia" and operationally-gained by the Air Combat Command (ACC). Previously nicknamed the "Cajun Militia", and before that the "Coonass Militia." 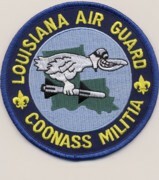 The title "Coonass Militia" was changed to "Cajun Militia" in 1992 because of concerns about its "political incorrectness". In the late 1990s the Cajun Militia title was changed to the current "Bayou Militia." The Louisiana Air National Guard origins date to 2 Mar 1941 with the establishment of the 122d Observation Squadron and is the oldest unit of the Louisiana Air National Guard. It is one of the 29 original National Guard Observation Squadrons of the United States Army National Guard formed before World War II. On 1 October 1941, the 122d Observation Squadron was activated into federal service as part of the build-up of the Army Air Forces prior to the Attack on Pearl Harbor. The modern Louisiana ANG received federal recognition on 5 December 1946 as the 122d Bombardment Squadron (Light) at New Orleans Lakefront Airport. It was equipped with B-26 Invaders and was assigned to Tactical Air Command. 18 September 1947, however, is considered the Louisiana Air National Guard's official birth concurrent with the establishment of the United States Air Force as a separate branch of the United States military under the National Security Act. Since its inception, the Louisiana ANG has participated in World War II, the Korean War, the Cold War, Operation Enduring Freedom, Operation Northern Watch, Operation Southern Watch, Kosovo, Operation Noble Eagle, Air Expeditionary Force Deployments, Operation Iraqi Freedom, and the Global War on Terrorism. Wikimedia Commons has media related to Louisiana Air National Guard.